You are looking at a hot development opportunity. Read on to find out how to get planning for a Dutch barn. Over the years architect Garry Thomas has been a regular contributor in the world of barn conversions, especially given his success on Grand Designs with Hillcott Barn; and now Dutch barns are the new hot-property residential build opportunity. Get your free copy of Garry’s planning secrets previously only shared with private clients: ‘how to get planning for a Dutch barn’ enter your name and email below and your free copy will be sent to you. 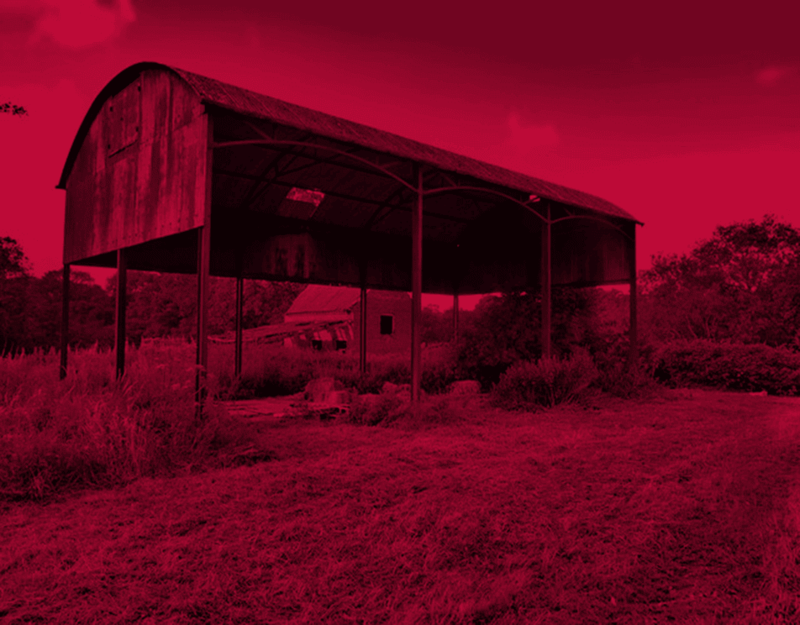 In December last year Garry unlocked development for a successful Dutch barn conversion by obtaining planning permission for a Dutch Barn, which was located in open countryside, near a remote Herefordshire village. The secret to this success is demonstrating agricultural heritage value and that Dutch barns are ‘buildings’ in planning terms. In many ways Dutch barns are the forgotten national heritage building. They document farming and agricultural heritage during the depression years, when materials and budgets were scarce; often they were built using iron railway tracks used as columns, riveted curved angle iron for roof trusses, and curved corrugated iron sheeting for roofing. At Thomas Studio we have opened up the possibility for many Dutch barn structures, previously considered not worthy. Embracing the open structure of these buildings, is important to celebrate the heritage value of the building. There is real beauty in the utilitarian simplicity, but you do have to work with the rhythm and position of structural bays, to ensure the structure, form, and original materials work with the design, rather than jar with the proposed conversion. Dutch barns vary in height and as such, sometimes they are able to accommodate two storeys; or if not, an internal double-height or mezzanine space could be an effective space-planning solution. Given the utilitarian nature of Dutch barns they allow use of cheaper cladding materials too. Rusting metal, rough sawn timber, cement board, anything goes with these buildings. Up to a point! Another challenge with Dutch barns is fitting in all the rooms and functions necessary in a modern home, without subdividing the space awkwardly. At Thomas Studio we always try and make space feel open-plan, retaining the scale of the space, within what is an agricultural utility building. Barns can provide real drama and character with ample uncluttered space, keeping the traditions and heritage alive, whilst maintaining modern living comfort as the barn is transformed, is key to it’s success. Interior design and fit-out is also a key component to get right. The interior and exterior should relate, no flimsy construction here, more rustic and more robust works well within a Dutch barn, especially if you can make use of material found onsite. Stone slabs, shutters, doors, and any other farm equipment can often inform the design and be put to good use. This could be through simple, rustic, agricultural-inspired construction, using traditional materials, or contrasting super-sleek modern minimalism. The look and feel of interior spaces is always a client bespoke item, and at Thomas Studio we make sure the design is as you would like it. What is important is the dialogue with the buildings roots. When built, Dutch barns were not conceived for human habitation. As such, they usually have very few side panels, if any at all. This does mean that sidings are designed from scratch. Getting light into all the rooms is relatively simple, as the building envelope can be arranged with openings, and the distribution of these openings can flow around each elevation, with the demands of interior spaces in mind. The difficult area is the roof, as roof lights tend to be flat and Dutch barns have a curved roof profile, these should be avoided. There are no hard and fast rules, but we tend to start with the light and view, locating the principal habitable rooms where the views and sunlight is projected, while accepting that some parts of the building will, most likely, be dark. Utility, plant rooms and WCs, may only have borrowed light but if handled well and contrasted against spacious, light-filled living and circulation areas, they can be an interesting counter note in the wider composition of the design. Dark, cosier spaces may well lend themselves to snugs and living rooms for evening use. We do all we can to avoid modifying the existing structure. Where it is absolutely crucial, we consider this within the vein of the existing structure. Dutch barns were designed with modular construction in mind, so we try and continue that within the proposed plan arrangements. Most Dutch barns are a simple rectangular shape, as a 3, 4 or 6 bay configuration, with a curved roof profile, so roof lights to get light into the middle of the building should be avoided to maintain the monolithic integrity of roof profile. As a result of planning application success, it is now recognized that Dutch barns form an integral part of Britain’s agricultural heritage, and for the purposes of planning definition, Dutch barns are ‘buildings’. The key to un-locking planning permission for the conversion of a Dutch barn, to residential use, is local NEED, a sustainable LOCATION and good sympathetic DESIGN. A recent update to permitted development regulations, Paragraph 105, has attempted to lay down guidance about the suitability of conversion and whether the structure can accommodate conversion to residential use. This does introduce hurdles to over come, but that said there is no denying that Dutch barns are an important local heritage asset, and whilst they have very little if any modern agricultural benefit, they are very suitable and desirable as housing conversions, and make for a very real hot-property development opportunity.